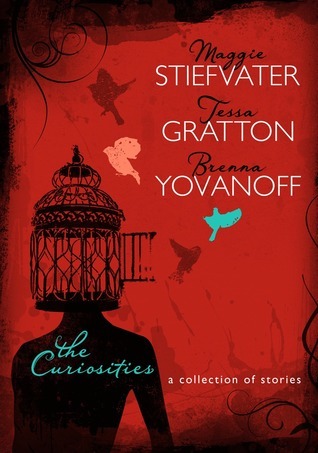 “From acclaimed YA authors Maggie Stiefvater, Tessa Gratton, and Brenna Yovanoff comes The Curiosities: A Collection of Stories. - A vampire locked in a cage in the basement, for good luck. - Bad guys, clever girls, and the various reasons why the guys have to stop breathing. - A world where fires never go out (with references to vanilla ice cream). But The Curiosities is more than the stories. Since 2008, Maggie, Tessa, and Brenna have posted more than 250 works of short fiction to their website merryfates.com. Their goal was simple: create a space for experimentation and improvisation in their writing—all in public and without a backspace key. In that spirit, The Curiosities includes the stories and each author's comments, critiques, and kudos in the margins. Think of it as a guided tour of the creative processes of three acclaimed authors. The Curiosities is like nothing I've ever read before. It's like reading through author's notes. It's informative and helps the reader see how the author's mental process works, and there are a lot of fun comments and sketches in the margins from the other authors! While seeing writing in progress and reading comments from all three authors about their works, you are simultaneously being entertained by the short stories themselves. I found I just wanted to keep reading them. So while you could read slowly and do one or two stories at a time, more likely you'll breeze through this collection in no time. The stories were fantastic. Each one a little bit better than the next. They are all about different subject matter but they all carry the magic that each writer installs in all of their work, do fans of Maggie Stiefvater, Tessa Gratton, and Brenna Yovanoff will be pleased by this collection. But if you haven't read these fabulous authors yet, no fear. The Curiosities will serve as the perfect introduction to their work. The Curiosities is the perfect book for writers, but will also keep us readers fascinated an highly entertained. But best of all, I think, is that the stories and the way they are presented is very inspiring to young writers. I highly recommend it to everyone and will be purchasing a finished copy for myself! For more about The Curiosities check out these sites! This sounds really neat! It's definitely not something I would have picked up, so thanks for sharing - I'd love a copy so I can see the notes/doodles in the margins! I definitely recommend it! It's really a lot of fun to read!